... in energy saving heating equipments is the basis of the development of DEFENDER air curtains which help to solve those problems caused by frequently opened doors in buildings having heating equipments installed. ... replaced by an elegant front panel with a surrounding absorbing slot as well as two central slots over the full length of the air curtain. CHARACTERISTICS: AIR CURTAIN Complete with remote control. LA: only ventilation version. LA BE: eletrical heating version. Mounting with brackets included in delivery and fitting in modular ceiling. A hot air curtain is a heating system generally situated adjacent to the doors of shopping centers, cinemas, restaurants and similar locales to maintain comfortable interior temperature. ArchiExpo offers a variety of hot and cold air curtains for different building types. These devices are primarily intended for buildings open to the public in order to reduce the ingress of cold air when entry doors are opened. Such systems consist of an adjustable blower grate installed either vertically along the wall or horizontally in the ceiling. 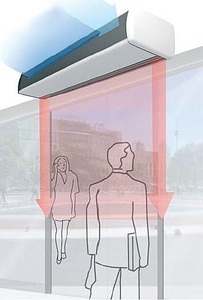 The warm air stream ensures comfort in the area around the doors.